Comedy may not be able to cure hunger by itself, but good people willing to help and laugh sure can. What if you could help cure hunger with some good old-fashioned comedy? Local comedian Max Price and The Funny Bone believe in this unconventional strategy and are putting their money and time where their mouth on Dec. 5 at Westport Plaza. Price hosts "The Best of STL Comedy Showcase every month and has worked it into being the top rated and highest attended local comedy event. You aren't getting actor turned comic wannabes walking up on stage asking for your money. At this event, if you mention Max Price at the door, you and your friends get in free. Free to laugh, have a good time, and participate in a good cause. What is the good cause? STL Foodbank. Since your ticket is covered, Price and company encourage you to bring a canned or boxed food item to the event, so the less fortunate can find something to eat this holiday season. It's a good deed that costs you 65 cents or the can of corn in the back of the pantry that you have been avoiding since the Fourth of July. You can also walk home with a cool t-shirt, which can be a mood boost to anyone's wardrobe. One of the show's sponsors, Steryotype Clothing, will have some amazing designs on shirts available for purchase after the show. For every shirt sold, Price and Steryotype will donate $5 to STL Foodbank, and the other two sponsors-Southwest Diner and Steel and Ink Studio-will each donate five cans of food. Get a shirt and good things happen as a result. Where else can you get a collaboratively designed t-shirt and help someone in the process? You can at this special event. When you buy a shirt, Steel and Ink Studio will give you a 15% off coupon for your next (or first) tattoo, as well as a gift certificate to the best breakfast in town at Maplewood's Southwest Diner. Price, who seemingly doesn't sleep and spreads his talents around the entire city, is a server as the restaurant, so expect some laughs with Jonathan's Fiery Scramble and a Bloody Mary with bacon in it. In addition to the good deeds and free stuff, the comic talent on display this December is sure to leave you with some jokes for the Monday water cooler break time. Sean O'Brien is a Funny Bone mainstay and fan favorite, and Spencer Teghtmeyer, winner of last year's Funny Bone competition winner, will be doing sets. 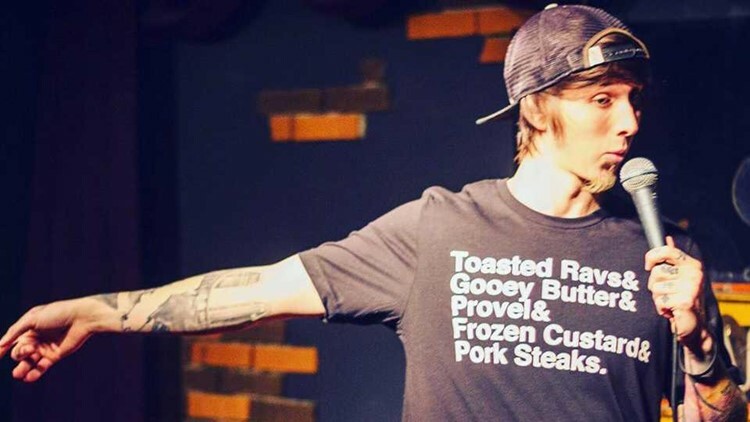 Nick Nichols, a Kansas City resident and St. Louis native, is returning to his hometown to toss some laughter into the audience. You can bet Price will get up on stage and make you laugh with his jokes about fatherhood and infinite tales of adulting. So, let's recap. Mention Price and get in free. Bring the can of white beans you have been holding onto for March's chili cookoff. Buy a shirt, get a gift bag, and help donate to STL Foodbank in the process. Get a great list of comics making you laugh on a Wednesday night in St. Louis county. In this maddening world of bad drivers and failed Loop Trolley experiments, all the laughs are needed. At the end of the day, it's supporting local artists and local companies trying to help people out. By giving back and paying it forward, you are treated to free comedy, cool t-shirts, discount on a tattoo and the comfort food you'll need after getting said tattoo on your shoulder. All around, it's a fine idea for some hump day entertainment. The show starts at 7:30 p.m. and the doors kick open at 7 p.m. Price regularly posts updates on each month's show on "The Best of STL Showcase" Facebook page, and you can follow him on Instagram (@maxpriceisme) for further updates and hilarious jokes that should perk up the work day. If you go on Dec. 5 and laugh out loud, message Max about January's show. Comedy may not be able to cure hunger by itself, but good people willing to help and laugh sure can. It takes a village in this world to move the needle on timely issues. For Max Price and The Funny Bone in Westport Plaza, comedy is always the best medicine for harsh times.